Just over twenty-five years ago, on 2 August 1990, Iraqi dictator Saddam Hussein unleashed his army on his neighbor to the south, the small, oil-rich country of Kuwait. Spearheaded by the elite Republican Guards Forces Command (RGFC), Iraqi forces overran Kuwait by the evening of 3 August and were poised on the Kuwait-Saudi Arabian border. Was Saudi Arabia Hussein’s next target? If so, the small Saudi army would not be able to stop such an attack by itself. U.S. President George H. W. Bush declared that Iraq’s aggression would not be allowed to stand and, following a Saudi agreement on 6 August to allow forces to be stationed on Saudi soil, the buildup, eventually designated Operation DESERT SHIELD, began. On 7 August, the U.S. 82d Airborne Division began arriving in Saudi Arabia. U.S. Air Force F-15C fighters were on station by 9 August. From August until the end of October, additional U.S. forces arrived, including the 1st Marine Division, the 101st Airborne Division (Air Assault), the 24th Infantry Division (Mechanized), the 3d Armored Cavalry Regiment (ACR), and the 1st Cavalry Division (CD). In addition to providing its own forces, the United States sought to put together a coalition to oppose Hussein. The French provided the 6th Light Armored Division, while the British sent their 7th Armoured Brigade (later joined by the 4th Armoured Brigade to form the 1st Armoured Division). The Arab nations of Egypt and Syria deployed three divisions. By the end of October, the build-up of forces for the defense of Saudi Arabia was sufficient for everyone to breathe a sigh of relief. Nevertheless, coalition forces could not relax their vigilance as Iraq also sent reinforcements into Kuwait and to the Iraq-Saudi border to the west, reaching a strength of 400,000 soldiers manning 3,600 tanks, 2,300 armored personnel carriers and infantry fighting vehicles, and over 1,300 artillery pieces by 16 November. Command of the growing and diverse coalition forces was split. Most of the Islamic ground forces were controlled by Saudi Arabian Lieutenant General Prince Khalid ibn Sultan. American, British, and French ground, air, naval, and special operations forces came under U.S. Central Command (CENTCOM), led by General H. Norman Schwarzkopf, Jr. The Army component command under Schwarzkopf, Army Forces Central Command (ARCENT), also designated Third Army, commanded by Lieutenant General John J. Yeosock, had operational control of most U.S. Army, British, and French ground forces. Finally, under Third Army, the U.S. XVIII Airborne Corps, commanded by Lieutenant Gary E. Luck, exercised tactical control over most of ARCENT’s ground forces. By the end of October, a standoff had developed along the border between Kuwait and Saudi Arabia as Hussein refused all demands to evacuate his forces from Kuwait. How long was this situation to continue? 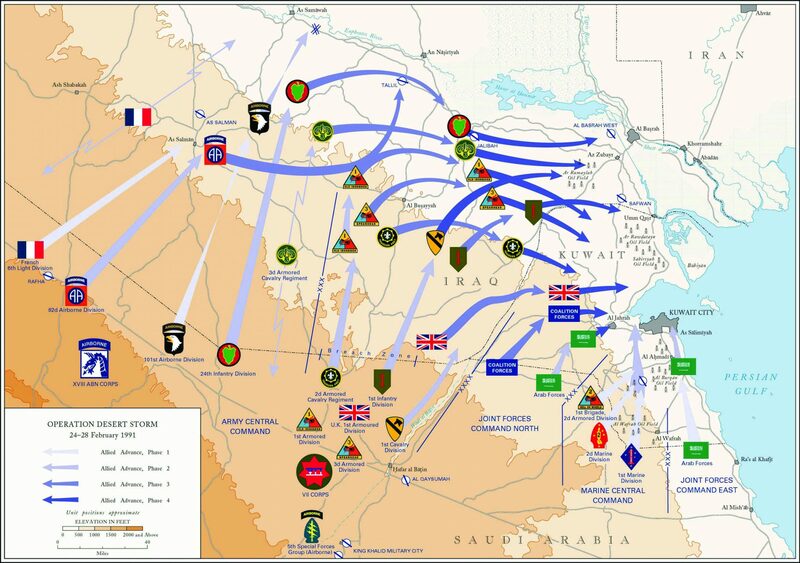 In a dramatic new development, on 8 November President Bush announced that VII (Jayhawk) Corps, stationed in Germany, would deploy to Saudi Arabia, as would additional forces from the United States, notably the 1st Infantry Division (ID) (Mechanized), commanded by Major General Thomas G. Rhame, stationed at Fort Riley, Kansas. It did not take a military genius to realize the significance of deploying this large, tank-heavy force. The United States was not going to tolerate the standoff with Hussein for much longer. For six men seated in front of the television in the basement of VII Corps headquarters at Kelley Barracks, Stuttgart, Germany, President Bush’s announcement came as no surprise. On 28 October, General Crosbie E. Saint, commander of U.S. Army Europe (USAREUR), had directed VII Corps Commander, Lieutenant General Frederick M. Franks, Jr., to form a small, close-hold staff cell to begin deployment planning. Early on in the process, Saint and Franks had to decide which units in Germany would deploy. The chosen units would not necessarily all come from those currently part of VII Corps. Assigned to the two U.S. Corps in Germany (V and VII) were two armored and two mechanized infantry divisions, two separate brigades, and two armored cavalry regiments, among others. The need for a tank-heavy force, the status of equipment modernization, the state of training, and readiness (specifically the fact that some units were in the process of standing down as part of the downsizing of U.S. forces in Europe) affected Saint’s and Franks’s decisions. The armored divisions (ADs), the 1st commanded by Major General Ronald H. Griffith and the 3d under Major General Paul E. Funk, were chosen to deploy, but the fully modernized 3d Brigade, 3d ID, replaced the 1st AD’s 1st Brigade. A separate brigade, the 2d AD (Forward), was selected as an additional brigade for the two-brigade 1st Infantry Division (ID) rather than choosing the division’s own forward-deployed brigade in Germany, the 1st ID (Forward), because the latter was in the process of inactivating. For the same reason, two battalions from the 8th ID filled out the 3d AD. Finally, Colonel Don Holder’s 2d ACR would deploy. Putting together the combat support and combat service support needed for such a large, mechanized force was challenging, to say the least. VII Corps, long reliant on host nation support in a theater with a well-developed infrastructure, now needed substantial additions in signal, medical, transportation, and engineer support. The corps’s 2d Support Command (COSCOM), commanded by Brigadier General Robert P. McFarlin, would grow from about 8,000 personnel in Germany to 24,000 in Southwest Asia. This rapid expansion would not have been possible without the addition of 19,908 soldiers from 166 National Guard and Army Reserve units, most of which would serve with the 2d COSCOM. Thus the major subordinate units deploying with the corps were identified prior to the 8 November public announcement, allowing Franks to immediately convene a commanders’ meeting on 9 November. At the meeting he laid out a training focus. Units would emphasize gunnery and weapons skills, nuclear, biological and chemical (NBC) training, command and control (C2) of large formations, desert survival, and host country customs. With this guidance, the subordinate commands could develop their training plans. Franks also told his commanders and a few key staff members that they would depart for Saudi Arabia for a leaders’ reconnaissance on 11 November. 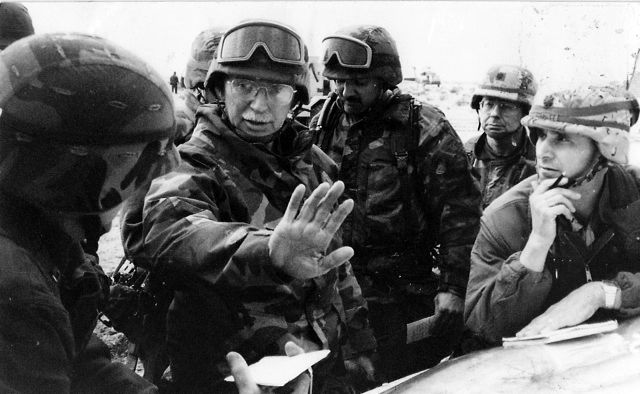 During the trip, they learned that VII Corps would be the main effort in the offensive to liberate Kuwait. The corps’s mission was to destroy the RGFC in its zone of attack. This basic guidance never changed, allowing VII Corps to focus its planning and training efforts. The reconnaissance also allowed for coordination with Lieutenant General Yeosock as VII Corps, like XVIII Corps, would fall under ARCENT control. Assembly areas and ports of debarkation were selected and an initial time-phased force deployment list emphasizing getting combat service support units into the theater early was adopted. Even as the reconnaissance was ongoing, VII Corps established a deployment cell under the corps deputy commander, Brigadier General Eugene L. Daniel. The sequencing of units out of Germany would be the 2d ACR, Corps C2 assets, 2d COSCOM, 1st AD, 3d AD, and 2d AD (Forward). The nondeploying 3d ID ran the port support activities in Europe, providing loading teams at Antwerp, Bremerhaven, and Rotterdam. Host nation, USAREUR, and U.S. European Command support was essential in the deployment process. In all, 49,008 U.S.-based soldiers and 73,369 USAREUR-based soldiers would deploy to Saudi Arabia with 48,600 vehicles in ninety-seven days. Deployment began on 12 November when 2d Squadron, 2d ACR, began rail loading from its home station at Bamberg. In Germany, 465 trains, 119 convoys, and 312 barges moved soldiers and equipment to aerial and seaports of embarkation, where 435 aircraft and 109 ships took them to Saudi Arabia. An additional 143 aircraft and thirty-one ships brought U.S.-based forces to the desert. Establishing a separate deployment cell allowed Franks and his subordinates to focus on training and planning. A small, close-hold planning cell convened at Kelley Barracks on 26 November. Franks briefed the plan they developed to the ARCENT commander in Riyadh on 7 December. 1st ID would breach the front-line Iraqi defenses west of the Wadi al Batin and then the other Corps forces (2d ACR, 1st AD, and 3d AD) would pass through the breach and attack to the northeast, where the three heavy divisions of the RGFC (the Tawakalna Mechanized Division and the Medina and Hammurabi Armored Divisions) were positioned in depth. Franks wanted to concentrate a three-division fist against the RGFC and have an additional division to pass thorough the breach and swing sharply to the east to destroy Iraqi tactical reserves that could interfere with the force attacking the RGFC. At this point, that was two more divisions than VII Corps had. In mid-December, Franks was told that the 1st (UK) AD would join VII Corps. The 1st (UK) AD would take on the mission of destroying the Iraqi tactical reserves. Franks and his staff deployed to Saudi Arabia on 14 December. On 20 December in Riyadh, Franks and the XVIII Airborne Corps commander, Lieutenant General Luck, briefed their plans to Secretary of Defense Richard B. Cheney and Chairman of the Joint Chiefs of Staff General Colin Powell. XVIII Corps would attack to the west of VII Corps, driving due north to the Euphrates River valley. VII Corps’s plan was essentially the same as briefed on 7 December, although Franks added that he would seek an opportunity to bypass the Iraqi defenses to the west rather than pushing the entire corps through a deliberate breach by 1st ID. While VII and XVIII Corps attacked in the west, coalition forces, including the U.S. Marines, would attack directly into Kuwait. Finally, the 1st CD, positioned just west of the Wadi al Batin, would conduct deception operations to convince the Iraqis that the main attack would be up the wadi. On 8 January, 1st CD was placed under operational control of VII Corps. It conducted a series of demonstrations, artillery raids, and Apache helicopter strikes as part of the deception plan. Just before the ground war, however, on 23 February 1st CD reverted to ARCENT control as theater reserve. While the planning proceeded, a myriad other activities were ongoing. Of primary concern, of course, was the marrying up of troops arriving at the King Abdul Aziz Air Base and King Fahd International Airport with their equipment arriving at the ports of Al Jubayl and Ad Damman. After linking up with their equipment, the units moved to designated tactical assembly areas (TAAs) east of King Khalid Military City (KKMC). However, ship breakdowns and delays caused a buildup of troops awaiting their equipment in the port areas far in excess of what was planned. 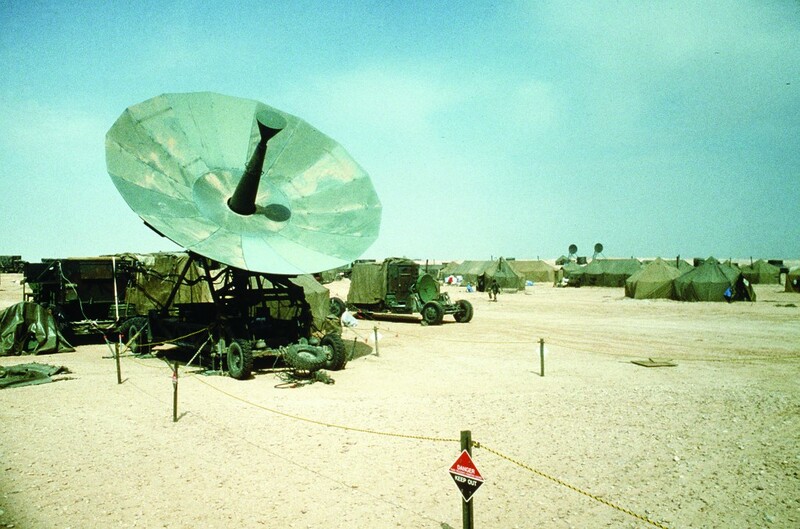 The ad hoc port support activities headquarters was inadequately staffed to handle this dilemma, so Brigadier General William J. Mullen, commander of 1st ID (Forward) in Germany, was tasked to bring his chain of command and necessary equipment to Saudi Arabia to assume the port support activities mission. The arrival of his team of about 800 soldiers just after Christmas led to immediate improvement in the reception and onward movement process. Further delays hampered the movement of units to their TAAs. Most had to move along a single, two-lane hard surface road known as Tapline (Trans-Arabian Pipeline) Road. A lack of heavy equipment transporters (HETs) further delayed movement. On 22 January, 1st AD and 3d AD began road marching some of their units to the TAAs. In the midst of all this deployment activity, modernization actions were ongoing. Mine rollers, plows, rakes, and the new M9 Armored Combat Earthmover were issued, with priority to the 1st ID to support the breaching operation. 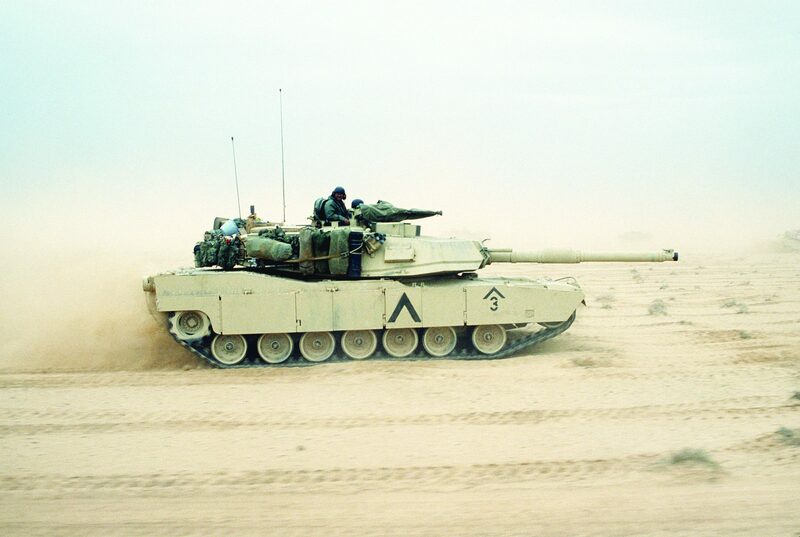 Armor battalions with M1 Abrams tanks received the upgraded M1A1 tank, which featured a more powerful 120mm main gun. Only two battalions would go to war with the still capable basic M1 armed with a 105mm gun. The 2d ACR drew improved and more heavily armored M2A2 Bradleys. Commercial utility cargo vehicles (CUCVs) were replaced by the more versatile and mobile HMMWV (High Mobility Multipurpose Wheeled Vehicle, or “Humvee”). Additional Heavy Expanded Mobility Tactical Truck (HEMTT) fuel trucks were issued. Keeping the fuel-guzzling M1 tanks running was going to be an obvious challenge. Also, about 3,000 of the new-fangled Global Positioning Systems (GPS) sets immensely improved navigation and artillery fires . This equipment would give the VII Corps a decided technological advantage over the Iraqis, whose RGFC was equipped with less-capable Soviet-built T72 tanks and BMP infantry fighting vehicles. Most Iraqi regular army units used the outdated T55 tank and BTR series or MT-LB personnel carriers. The U.S. equipment advantages alone, however, were not decisive. It was the use of this equipment by highly trained and skilled crews that ultimately made the difference. Once units arrived in their TAAs, they had three to four weeks training time to hone their skills. Each major subordinate command established firing ranges where vehicle and air crews fired service ammunition at long ranges, something not possible in Germany. Units also practiced tactical maneuver, learning to build fire support and field trains into their formations. Finally, staff training exercises and rehearsals sharpened skills. The 1st ID, for example, built a full-size mockup of the Iraqi defenses that it would breach. Finally the time came for VII Corps to move from its TAAs to its final attack positions as far as 160 kilometers to the west and north. By coincidence, the Iraqi VII Corps, positioned along the western end of Iraq’s defenses, would face the U.S. VII Corps. The western most Iraqi division was the 26th ID with two brigades defending the front line and a third brigade echeloned well to the rear and west. The 1st ID would breach the 26th ID defenses and the 1st (UK) AD would pass through and attack to the east to destroy Iraqi tactical reserves, specifically the 52d Armored Division. The rest of the corps would not follow through the breach as originally planned. With the 2d ACR covering the 3d AD on the right and the 1st AD on the left, the corps would sweep around the open western flank of the 26th ID’s defenses and drive north. The final shift to attack positions occurred from 14 to 17 February. This move served as a valuable rehearsal, as units moved in the formations in which they would attack. Lieutenant General Franks also took the opportunity to rehearse his C2. Moving in the three M113A3 personnel carriers that constituted his command group, Franks found that FM radio communications were spotty at best. He therefore decided that he would travel about the battlefield in his UH-60 Black Hawk helicopter accompanied by a portable Tactical Satellite (TACSAT) radio. In between helicopter trips, he would base himself at whatever forward corps tactical command post (TAC) was stationary and operating. He had two such mobile command posts, one of which would be moving forward while the other was stationary: the TAC run by his G-3 Operations Officer, Colonel Stanley F. Cherrie, and Jump TAC, under an assistant G-3, Lieutenant Colonel David McKiernan. The main CP with the corps Chief of Staff, Brigadier General John R. Landry, remained in Saudi Arabia, just south of the border, for the duration of the war. The war had actually started, of course, on 17 January with the initiation of the coalition air campaign that degraded Iraqi logistics and air defense and assured coalition air supremacy. However, it had only a limited impact on Iraqi ground forces. The disruption of Iraqi C2 and intelligence operations may have been one of the most important aspects of the air war. The VII and XVIII Corps shift west into final positions was apparently not detected, or if so, not reacted to by Iraqi forces. The ground offensive (“G-day”) began on 24 February, delayed three days by futile last-minute negotiations by the Soviets to convince Hussein to leave Kuwait. The ground offensive commenced early on 24 February when the Islamic Coalition forces and the U.S. Marines attacked into Kuwait while elements of XVIII Corps raced north against minimal opposition. VII Corps and much of the XVIII Corps were not to attack until G+1. VII Corps units edged forward, cutting lanes in the border berm and pushing into Iraq. The 1st ID was busy positioning three of the corps’ four artillery brigades plus two division artilleries (DIVARTY’s) in preparation for firing a planned 2½ hour preparatory barrage the next day. In the midst of this activity Franks received a call at about 0930 from Lieutenant General Yeosock relaying a query from General Schwarzkopf. Based on the offensive’s early success, could VII Corps attack early—on 24 February and not the following day? Franks gave a tentative yes, then checked with his commanders. They said they could do it. The 1st ID faced the greatest challenge, as it would have to hurry its artillery into position and reduce the length of the planned preparatory barrage. At 1300, ARCENT informed VII Corps that the G+1 attacking force would attack in two hours. At 1430, 1st ID began a 30-minute artillery preparation and attacked the Iraqi 26th ID at 1500. Resistance was sporadic, with many Iraqi soldiers choosing to surrender. Many who fought were plowed under in their trenches by tank-mounted mine plows and armored combat earthmovers. 1st ID began clearing and marking lanes through the enemy defenses. The 1st (UK) AD, which would move through these lanes when completed, began moving toward the breach site. The 2d ACR began its attack northward at 1430, covering 1st AD and 3d AD, which moved abreast, with 1st AD to the west, keeping about ten kilometers behind 2d ACR. By dark, 2d ACR had advanced forty kilometers, meeting only scattered resistance and capturing several hundred prisoners from the Iraqi 26th ID, whose main defenses 2d ACR had bypassed to the west. The two AH-64 Apache attack helicopter battalions from the corps’s 11th Aviation Brigade, commanded by Colonel Johnnie Hitt, stood by, ready to attack any Iraqi reserves which might try to intervene. The brigade remained on alert the following day as well, but no enemy forces reacted. Soon the Iraqi tactical reserves would be fighting for their lives against the 1st (UK) AD. The weather on 24 February was typical of what the corps endured for the duration of the war—cold, mostly cloudy, with morning rain showers. Afternoon winds from the southeast brought blowing sand, often reducing visibility to 1,000 meters or less. Winds subsided in the evening, but overcast skies made for a dark night. Several times during the war, adverse weather conditions would prevent the Air Force A-10’s from flying close air support, and on occasion, even helicopters were grounded. As darkness approached, Franks faced a decision— continue the attack, or halt until first light. He elected to halt, a decision that Rhame and Holder concurred with. The 1st ID, while enjoying great success, would have to complete breaching the enemy defenses at night, something it had not rehearsed. Continued movement of the enveloping force (2d ACR, 1st and 3d AD) could string it out, and Franks wanted it concentrated for the fight with the RGFC. Also, the likelihood of bypassing enemy forces in the dark was high, and the 806th Brigade of the Iraqi 26th Division was known to be in the path of the enveloping force. Finally, a sandstorm kicked up around midnight, which would have made breaching, clearing the zone, and maintaining formations extremely difficult. Units closed up their supporting artillery and logistics, refueled, and conducted artillery and helicopter strikes. At 0600 on 25 February, 1st ID resumed its attack. By 1100, it had breached the Iraqi defenses and completed the destruction of the Iraqi 26th ID. At 1200, 1st ID began forward passage of the 1st (UK) AD through twenty-four cleared and marked lanes. The Passage of 7,000 British vehicles took until 0200 on 26 February. The 1st (UK) AD attacked east as planned, protecting the flank of the enveloping force. It came into contact with the Iraqi 48th ID to the east of the 26th ID. The British ripped through the rear of the Iraqis, who were still facing south, and continued attacking east, next encountering the Iraqi tactical reserve, specifically a brigade of the 52d AD. While the British attacked to the east, the enveloping force continued its northward advance at 0600 on 25 February. 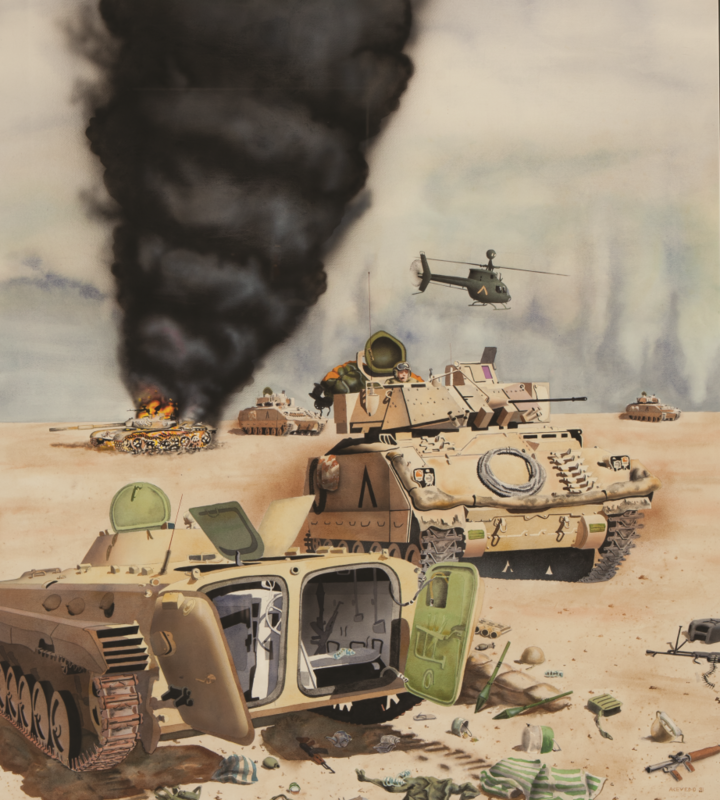 The 2d ACR began shifting to the northeast, uncovering the 1st AD, which moved northward to attack the town of Al Busayyah, an Iraqi logistics base defended by elements of the Iraqi 26th ID, a special forces battalion, and a company of T-55 tanks. Lying in the path of the 1st AD was the hapless, unsupported 806th Brigade, 26th ID, which was promptly overrun. The 1st AD halted at dark about ten kilometers short of Al Busayyah. The division commander, Major General Griffith, did not want to risk a night attack against dug-in infantry in a built-up area. Franks agreed to wait until dawn, but told him that he needed to attack through the area quickly and move on. The 2d ACR, now covering only the 3d AD, continued to the northeast. At 1200 it encountered the Iraqi 50th Brigade, 12th AD. It seems most likely that the Iraqi 12th and the 10th ADs, comprising the “Jihad Corps,” located to the east of the Tawakalna Division, had been placed under RGFC control and that the 12th AD had been ordered to move to the west to establish a security zone in front of the Tawakalna Division, which was now aware of the threat to the west. 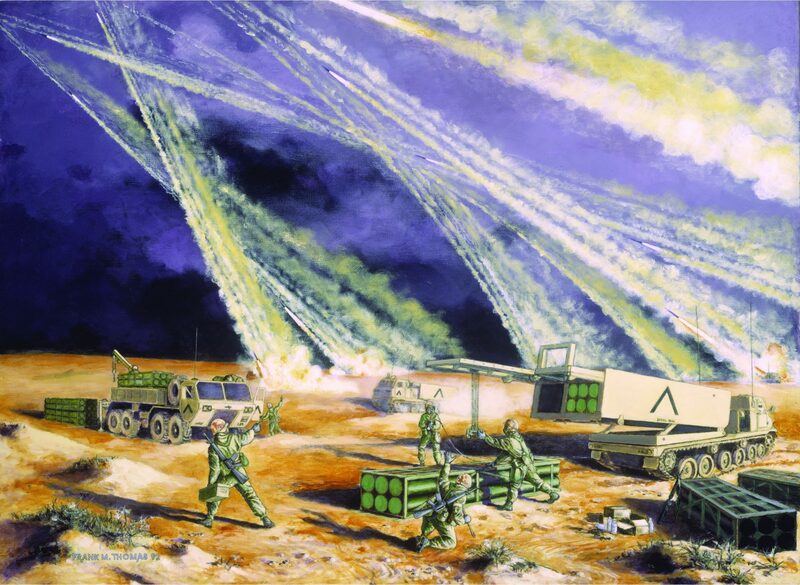 The 50th Brigade had been hit hard by coalition air strikes and was not yet in defensive positions when the 2d ACR completed the brigade’s destruction. At 0830 on 25 February, Franks flew from his TAC to his Jump TAC, which had moved forward. He called Brigadier General Landry and key planners to his location to decide on their next move. The RGFC remained in its positions, although the Tawakalna Division had oriented to the west and was preparing defensive positions. Franks had always wanted to concentrate a “three-division fist” to destroy the RGFC. The 1st CD, in theater reserve, was not available, so Franks ordered the 1st ID to move north as soon as the 1st (UK) AD had completed passage. The 1st ID would begin moving at 0430 on 26 February. Before the ground war started, VII Corps planners had developed several contingency plans that now paid dividends. One of those plans, FRAGPLAN #7, which envisioned the RGFC fighting from its current locations, was put into effect. Landry and the staff prepared the order while Franks visited his commanders and explained his intentions. The corps would swing east, with the 2d ACR uncovering the 3d AD, which would then be on the 2d ACR’s northern flank with the 1st AD north of it. The 1st ID would pass through the 2d ACR after the regiment had found and fixed the Tawakalna and located an open southern flank if possible. At 0615 on 26 February, following a final artillery preparation, 1st AD attacked through Al Busayyah and continued moving to the east, leaving a battalion task force behind to mop up. The 2d ACR pushed eastward as well, encountering security forces from the Tawakalna, which was defending with its three brigades on line from south to north. The 37th Brigade, 10th AD, extended the defensive line to the south. The 2d ACR struck the enemy main defensive positions by mid-afternoon. A series of confusing engagements ensued, with Iraqi forces attempting to defend and make local counterattacks. U.S. small-unit leadership, aggressiveness, and superior gunnery skills prevailed in what was soon dubbed the “Battle of the 73 Easting” (the north-south grid line of the main enemy defenses). When the 2d ACR broke off the fight that evening to prepare to pass the 1st ID, it had destroyed eighty-two tanks and twenty-three armored personnel carriers. The 2d ACR did not fight alone. 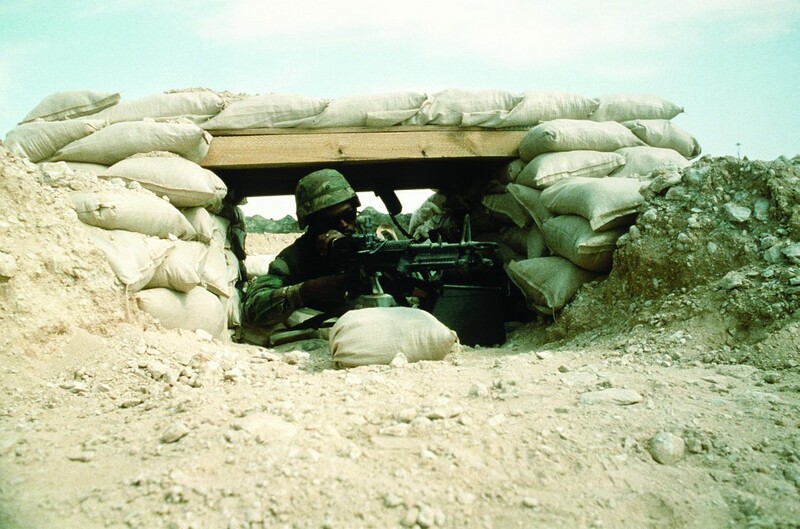 At 0500, 3d AD moved out in zone to the north of 2d ACR, encountering the Tawakalna defenses at 1600. In the “Battle of Phase Line Bullet,” as 3d AD called it, the fighting continued into the night as the enemy stood its ground. The 1st AD to the north of 3d AD, with the farthest to travel, moving east after overrunning Al Busayyah, ran into the north end of the Tawakalna defensive line at about 1800. Here the fighting continued into the night. At the other end of the corps zone, the 1st (UK) AD continued its attack eastward, protecting the corps flank and completing the destruction of the Iraqi tactical reserve, the 52d AD. It captured thousands of prisoners from the surprised and outflanked first-echelon infantry divisions. There was no letup in the fighting that night. After racing north from the breach area, the 1st ID arrived and conducted a hasty, and dangerous, passage through the 2d ACR at about 2200. As a result of good coordination, the passage came off without serious incident or casualties from fratricide. While the 1st ID, 3d AD, and 1st AD pressed their attacks, the corps carried out a deep attack with the 11th Aviation Brigade. The brigade struck the Iraqi 10th AD, positioned in depth behind the Tawakalna Division. Apaches destroyed thirty-three tanks, eighteen personnel carriers, and thrity-five other vehicles. Also on 26 February, at 0930, the theater reserve, the 1st CD, commanded by Brigadier General John H. Tilelli, still positioned along the Saudi-Iraqi border, was attached to VII Corps. Franks ordered the 1st CD to move through the 1st ID breach area to an assembly area behind the 1 AD for commitment against the RGFC. At 1100, the 1st CD began the 300-kilometer march. By the morning of 27 February, with enemy defenses crumbling, Franks believed that a double envelopment of the remaining RGFC forces might be possible. The 1st ID would break through to the south while the 3d and 1st ADs continued to attack. When the 1st CD arrived, it could pass through the 1st AD and envelop to the north. Franks briefed his staff, had them prepare a fragmentary order (FRAGO), and again made the rounds in his Black Hawk to visit his subordinate commanders. VII Corps made steady progress that day, completing the destruction of the Tawakalna and the 10th and 12th ADs. Franks’s plan for a double envelopment, however, was not to be. As the 1st AD continued to attack to the east, it ran into the Medina AD, which had shifted westward starting on the 26 February and taken up defensive positions to the north of the rapidly disintegrating Tawakalna Division to protect a massive Iraqi logistics area. The Medina’s sister division, the Hammurabi AD, began to withdraw to the northeast and out of VII Corps’s zone of attack. Meanwhile, the 1st CD arrived at about 1100 on 27 February after a grueling march, and Franks wanted to execute the northern pincer of his envelopment plan. The 1st AD, however, was fully engaged in a bitter fight, later known as the Battle of Medina Ridge. 1st AD commander Major General Griffith informed Franks at about 1800 that he could not disengage and shift south to open up a zone for 1st CD. Reluctantly, Franks told Griffith to finish his fight, which the 1st AD did with a vengeance, completing the destruction of the Medina Division and major elements of the Iraqi 14th and 17ht ADs, and capturing eight large logistics sites that the enemy had tried in vain to protect. Franks still wanted to implement his plan for a double envelopment with the 1st CD to the north and the 1st ID followed by the 2d ACR to the south, but at 2345 he received word that a cease-fire would go into effect at 0500. At 0300, ARCENT called to tell VII Corps that the cease-fire was pushed back to 0800 and that the offensive would continue until then. By 0800, the 1st (UK) AD and 1st ID had reached the Basrah-Kuwait City Highway, soon to be known as the “Highway of Death” because of the thousands of Iraqi and stolen Kuwaiti vehicles destroyed on it as the enemy fled north. At 0800, Franks called for the cease-fire. By 0800 on 28 February, VII Corps had been moving and fighting for eighty-nine hours. It had driven 260 kilometers, captured 22,000 Iraqi soldiers, and destroyed 1,350 tanks, 1,224 armored personnel carriers, 285 artillery pieces, 105 air defense systems, and 1,229 trucks. This was done at a cost of sixty-two killed and 235 wounded. Nine M1A1 tanks were destroyed and four damaged, fourteen Bradley Fighting Vehicles were destroyed and nine damaged, two helicopters were destroyed and three damaged, and nine other vehicles of various types were destroyed or damaged. Franks held a commanders’ meeting at his TAC at 1220 on 28 February to congratulate everyone on a superb performance. Before the corps could further reflect upon its victory, however, it faced an immediate challenge. At 0200 on 1 March, ARCENT informed the corps that, per Schwarzkopf’s orders, VII Corps would secure and set up a negotiation site at Safwan Airfield where coalition and Iraqi military leaders could meet on 2 March to establish the terms that would continue the temporary cease-fire. There was just one small problem: the site was not held by friendly units. The 1st ID, closest to the town of Safwan and the airfield to the west, drew the mission to secure the site. The division’s 1st Squadron, 4th Cavalry, and 2d Brigade moved north, only to discover that the Iraqis still held both locations. After some tense negotiations, a prominent display of 1st ID hardware, and flyovers by Apache helicopters, the Iraqis withdrew and the airfield and town were secured by 1800 on 1 March. Now began a scramble to set up the site on what was a bare airstrip with no facilities. Fortunately the Iraqis requested a 24-hour delay, and the site was ready when negotiations began at 1130 on 3 March. The Iraqis agreed to the coalition’s terms. Per the negotiations, a military demarcation line (MDL) was established essentially along the line in southern Iraq reached by coalition forces. The Iraqis were to withdraw all forces to north of that line. VII Corps, as it turned out, would remain in southern Iraq until 15 April, when the Iraqis accepted the terms of the formal United Nations (UN) cease-fire. VII Corps gradually assumed responsibility for the entire 500-kilometer MDL as, per the “first in, first out” redeployment policy, the XVIII Corps and 1st CD began redeploying. The 1st (UK) AD also began redeploying on 10 March. The Iraqis never seriously challenged the VII Corps forces along the MDL, no doubt in part because the troops still loyal to Hussein, especially the remnants of the RGFC, were busy brutally suppressing Shia insurrections in towns near the MDL, including Basrah and An Nasiriya. The result was a flood of refugees and Iraqi deserters into VII Corps lines, while the corps was already responsible for more than 16,500 people in the Iraqi towns within the MDL area. Eventually 8,000 refugees filled a camp set up south of Safwan. Another 10,000 refugees filled a camp established in Iraq northeast of the town of Rafhah. The corps’s units, assisted by teams from Colonel Robert Beahm’s 352d Civil Affairs Brigade, provided food, water and medical care. Eventually Saudi Arabia would accept these refugees. On top of refugees, 23,675 Iraqi soldiers had surrendered by 14 April, when surrenders were no longer accepted as a result of the permanent cease-fire agreement. As if the corps was not busy enough with civilians, refugees, EPWs, and securing the MDL, it also faced the massive task of destroying Iraqi equipment and supplies. The corps formed Task Force Demolition to coordinate this effort. Unit engineers would destroy equipment in the unit sectors while six battalions from Colonel Samuel C. Raines’s 7th Engineer Brigade scoured the corps rear area. Task Force Demolition destroyed 2,234 combat vehicles of all types, 2,646 wheeled vehicles, 966 ammunition dumps, and 622 bunkers. Fortunately, just as the Jayhawk soldiers were beginning to wonder if they would ever get out of the desert, the Iraqis agreed to the UN cease-fire. VII Corps units would return to assembly areas in the vicinity of KKMC. Indeed by 12 April, 2d ACR and 1st AD had already begun moving to KKMC, and the rest of VII Corps now followed. On 9 May, when all refugees that wished to do so had been relocated to Saudi Arabia, VII Corps ceased its humanitarian effort. From 1 March to 6 May, the Corps had distributed more than one million meals and more than 170,000 pounds of flour, rice, and beans. Corps engineers produced over 1.5 million gallons of potable water at local wells and the corps hauled and delivered more than 640,000 bottles of water and 600,000 gallons of bulk water. Medics and doctors had treated 29,400 patients. Redeployment of the 140,000 troops of VII Corps proved to be almost as challenging as the deployment process. Vehicles and equipment had to be serviced and washed. Equipment needed to be moved to the seaports and soldiers to the airports. On 12 May, with about sixty percent of VII Corps redeployed, the corps headquarters returned to Kelley Barracks in Stuttgart, Germany. The numerous military communities in Germany that had deployed units established stay-behind organizations to keep things going. The families of deployed soldiers also did a great deal to support themselves, forming family assistance centers and publishing local newsletters to keep families informed. The returning corps headquarters received a rousing welcome-home ceremony organized by these support groups. Many of the returning units faced inactivation as USAREUR began a significant reduction in force. VII Corps headquarters itself formally inactivated on 24 April 1992. Thus this story of victory must end on a cautionary note. The U.S. Army committed 333,565 soldiers to Operation DESERT STORM while maintaining substantial forces to meet commitments in Europe and Asia. Given the recent decision to cut total U.S. Army strength to 450,000, let us hope that a Jayhawk Corps is not needed again. It does not exist.